Heavyweight 10 mil polypropylene page holds twenty 35mm slides or 2x2 coin holders, no ID strips. Fits in most 3-ring binders. These Print File Archival Slide Holders provide an ideal acid free storage solution for 35mm slides. 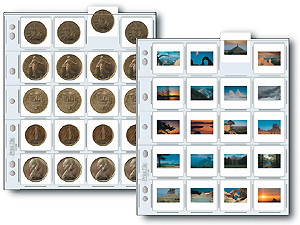 They can also be used as coin collecting pages.